← Happy 82nd Anniversary Granny And Pop. I love the Roseanne Show. I feel like the Connor’s were more like family than characters on TV. She screamed at her kids just like our Mother did. Dan worked sometimes and sometimes he did not like my Father did. The house was a wreck like ours was. Sometimes we had a rough time and was a day away from getting in trouble with the utilities, bank and such. So I can relate. Plus we had our own “Jackie” who is Aunt Janice. She took care of us and let us get by with murder like Jackie does Roseanne’s kids. We adore her. Gary and I are different than most others we know. We love old shows, In Heat Of The Night, All In The Family, The Jefferson’s, Sanford and Son and one of our most favorites Roseanne. We absolutely love the show. 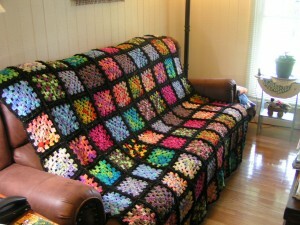 I have always admired the afghan on the back of the couch. I don’t crochet. 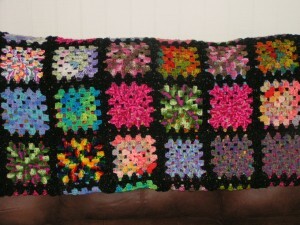 Well to be honest to you I can only do two things crochet wise, dishcloths and Granny Squares for afghans. I make the squares but I don’t like putting them together. I can knit and it is only dishcloths and scarves. 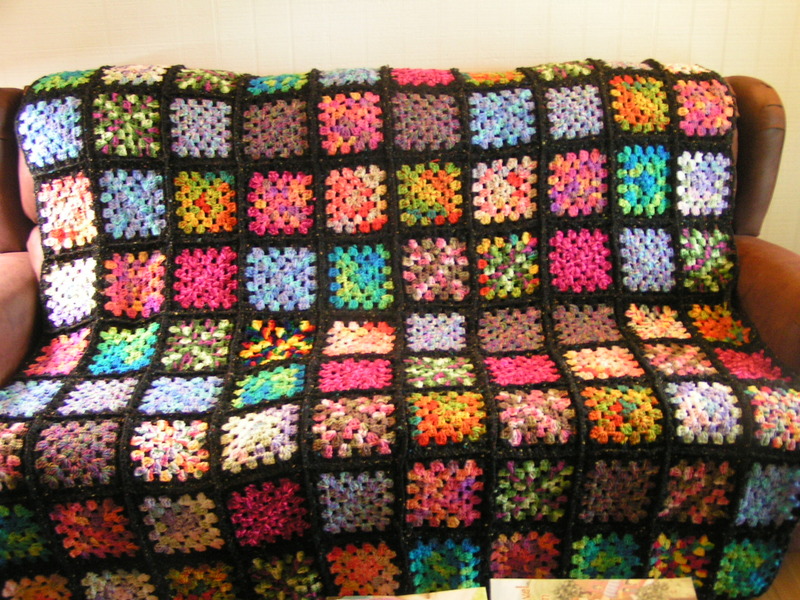 I got a wild idea during the winter I wanted a Rosie Afghan!! That is what I am calling it. Rosie. I sat here at night watching TV , on the computer reading newspapers and making the squares. It took me about one month to get them made. Then I started putting it together. After one row I figured out if I did not find someone to put the squares together for me I would going to have a heck of a Granny Square washcloth collection! Then came Kate. Kate is a family friend of ours. She stayed with my Mother in Law at night when she was alive for a while as one of her caregivers. She is also a walking miracle. She was leaving a grocery store one day after leaving Mrs. Wheeler’s home and woke up two weeks later in a hospital with just about everything broken in her body. A van hit her and dragged her before they stopped. It was touch and go for a while but she survived and if you did not know it you would not know anything ever happened to her. I hope when I get her age I am as spry as she is. Here is my Rosie. I love it and Kate so much for doing it for me. I could make the squares by the truck loads as long as I can get her to put them together! I hope you love Rosie as much as I do. Till winter it will be folded on the end of the couch. I LOVE IT and Thank you Kate so much. You are truly a sweet talented lady. Our family was blessed when we met you in a lot of ways. This entry was posted in Advertisement, Family Info, Family Stories, House Pictures. Bookmark the permalink. 9 Responses to Roseanne and Dan Connor..You Have Nothing On Me! I am so glad to hear Kate came thru such a horrible accident without any permanent damage! Wow! What a story! As for “Rosie”, I wish I had known Kate a few years ago. I got a box of yarn & stuff at a yard sale & there were stacks & stacks of squares in the bottom. Some of the most beautiful colors! I tried & tried to find somebody to put them together but coudln’t find anybody. I will have to look & see if there are any left anywhere around here. As for Roseanne, I always told everybody I took wife lessons from her. She is so funny. I always loved that show. That is beautiful. You must have air conditioning. Or else this might not be done until cooler weather. We are seeing reruns of Roseanne here in Australia on one of the free to air channels. 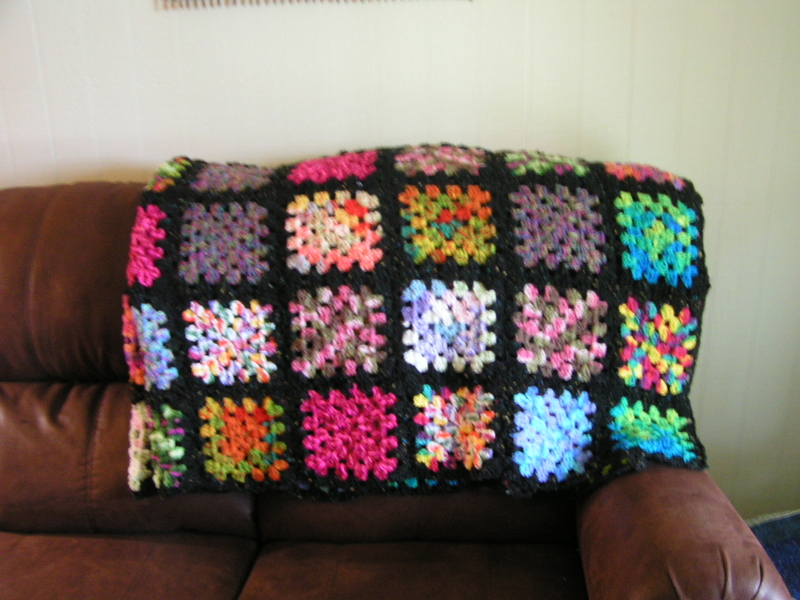 I really enjoy it, and I also try and spend an hour each morning watching “Touched by an Angel” and working on my handquilting! Bye for now, Sandy. Yes Kate is lucky to be alive. Terri, We have air..It was not bad making the squares. Putting them together found me bored to no end.. Kate turned on the air high she said and put them together. Sandra I hope you enjoy the Connor’s as much as we do. I never watched Touched by and Angel. I would love to see pictures of your rugs if you still have them. My dmil made one for us and I still have it. I don’t use it all the time, but I treasure it. Is this the friend that does tatting? I need to go see her one day next week. I want to learn more about tatting. I can do it a little, but need to ask a few questions. PS I love your Rosie! 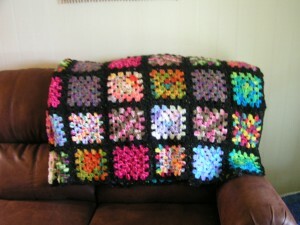 I love making squares too, but putting them together always bored me to tears – LOL! 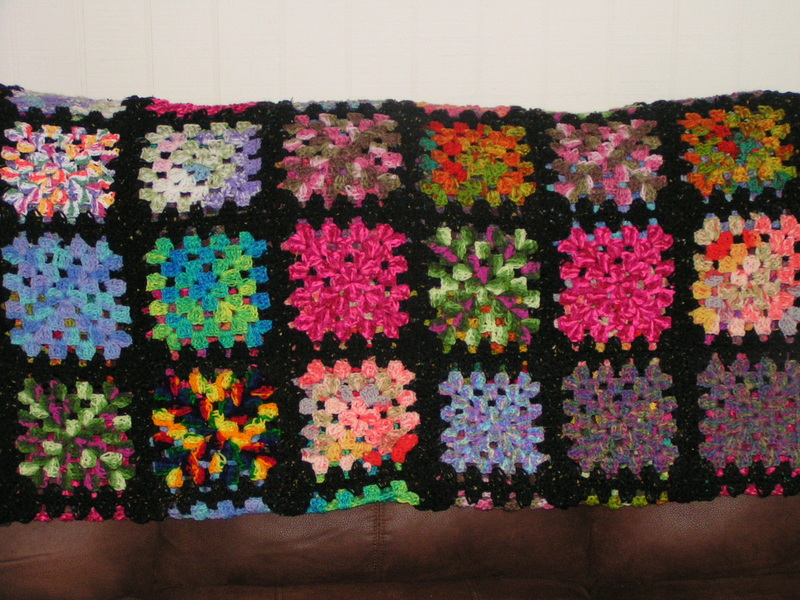 I love your Rosie afghan! Perfect!! 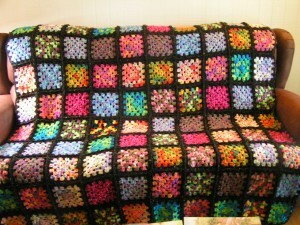 Chris, your afghan is beautiful. Surely a lot of work, but lovely in the end! I am a big fan of the Roseanne show too! I actually know the actress who played one of the waitresses at the diner that Rosie worked at one season. I’ll have to ask her what it was like working on the show one of these days.